As attorneys, we often hear the following: “My ex and I agree that neither of us want child support, and I want to write it down so my ex cannot ask for it later. Can you do this?” In North Carolina, parties cannot waive child support. The fact that the parties do not want child support can be put in a Separation Agreement, however, it is not binding and there is no way to enforce such a provision. The theory behind this is that when a separation occurs, the care and maintenance of the children of the marriage must continue to be provided. Even if the parties do not want child support right now, the needs of the children often change as the children grow older or as other circumstances warrant. Thus, child support is not a waivable claim. What if my income or my ex’s income changes? Over time, it is likely that your income or your former spouse’s income will change. Should this occur, child support can be modified under certain circumstances. 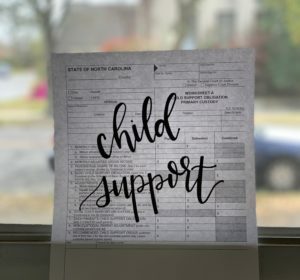 Child support can always be modified three (3) years after the prior child support order was entered and/or if there is a fifteen percent (15%) change in the child support calculation. Using our example from last week, say Spouse B was laid off from their job and gets a new job making significantly less than they were before. If Spouse B now makes $4,000.00 per month, instead of $6,000.00 per month, the new Worksheet A calculations indicate that child support would now be $1,044.00 per month paid from Spouse B to Spouse A. Spouse B would be able to file a Motion to Modify Child Support based on substantial change in income that resulted in a more than fifteen percent (15%) change in the child support calculation. Parties can agree to modify child support in less than three (3) years or less than a fifteen percent (15%) change income. When does child support end? Find out on next week’s blog!